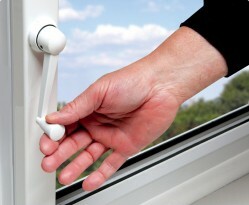 Manual remote opening systems can operate single or multiple high level windows by using a remote handle within reach. Often referred to as Teleflex winders which is actually an old brand name, there are actually several brands available such as Highline, Ultraflex Control Systems (USC) Ottelli Ricardo amongst the most popular options. All of these systems look very similar in design, and work on the same principles, many of the parts are interchangeable so call us for advice. 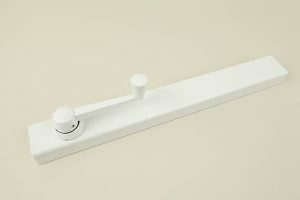 Suitable for both commercial and domestic applications, manual openers are traditionally used in schools but can be used in buildings for a cost effective solution where wiring is not always an option. 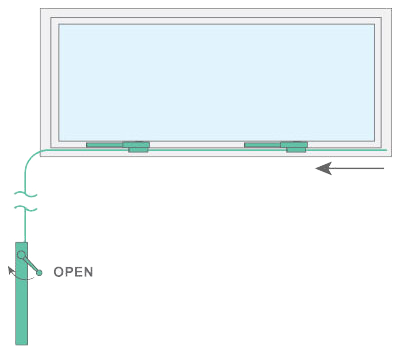 Basically you are winding a helical cable from an operating handle positioned at low level, through conduit fixed to your wall and window and through a cog in your chain opener which is fixed to your opening vent. 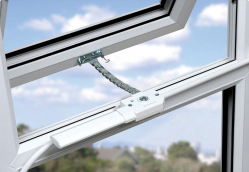 The cable drives a cog in your chain opener which will push out a chain fixed to your window, this will push open and pull closed your window or group of windows. There are several ways you can fit your manual openers, and we are experienced in working out the best configuration for your needs. Most of this information will come out of a quick conversation, and most situations are very similar so quoting is quite forward. If you were looking to open a large number of high level windows in a bank you may need to opt for a more powerful operating handle such as a Maxi operator as these can push with more force. But we have the experience to work out what you need.